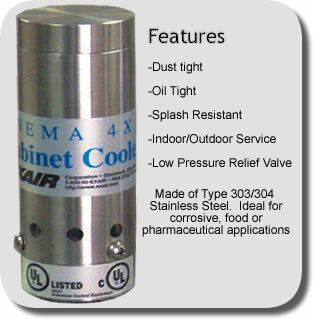 NEMA 4X (IP56) Cabinet Coolers (dust-tight, oil tight, splash resistant, indoor/outdoor service) are ideal for corrosive, food and pharmaceutical applications. 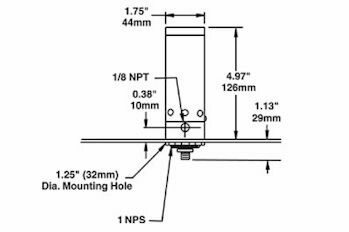 They have a Type 303/304 stainless steel construction and incorporate a low pressure relief valve for both the vortex tube and the Cabinet Cooler exhaust. 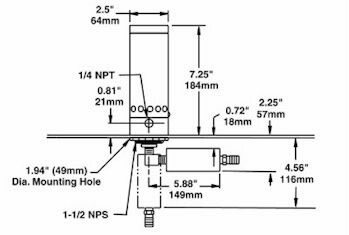 The valve closes and seals when the Cabinet Cooler is not operating to maintain the NEMA 4X integrity of the enclosure. Systems with thermostat control to minimize compressed air usage are available. Systems including an automatic drain filter separator to ensure no water passes through the Cabinet Cooler are also available. All EXAIR Cabinet Coolers are UL and ULC Listed.